In recent decades we have observed a significant reduction of the cryosphere due to anthropogenic climate change. The observed and predicted changes in the extent and amount of snow and ice will have major impacts on climate, ecosystems and human populations both at a local and global scale. This course will introduce students to the science behind climate change as well as the physical and chemical processes that govern components of the cryosphere, including snow, permafrost, sea ice, glaciers and ice sheets. Particular emphasis will be placed on the important role that each component plays in the larger climate system and potential feedbacks. We will also examine some of the social, economic and political impacts that the melting cryosphere will have on countries around the Arctic and also worldwide, such as access to new petroleum reserves, infrastructure damage due to melting permafrost, sea level rise and decreases in freshwater availability. Ferguson, Julie. 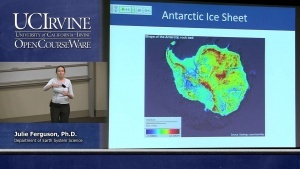 On Thin Ice 21 (UCI OpenCourseWare: University of California, Irvine), http://ocw.uci.edu/courses/ess_21_on_thin_ice__climate_chang... [March 14, 2015]. License: Creative Commons Attribution-ShareAlike 3.0 United States License. (creativecommons.org/licenses/by-sa/3.0/deed.en_US).